The name means ‘White Hollow’. On 7th August 1771 until at least 1774 David Griffiths, late of Noyadd Trefawr, lived here. On 19th May 1782 David Griffiths the younger and William Griffiths of Pantgwyn were both burgesses of Cardigan. In 1785 Willam Griffith of Pantgwyn married Ann Richard. On 13th July 1787 David Griffith of Pantgwyn wrote his will. He referred to Ann Richard – presumably his daughter-in-law; his son William Griffith; daughter Elinor Edward – the wife of Thomas Edward; second son David Griffith; and son Thomas Griffith. An elegy to Diana Griffiths of Pantgwyn by Ioan Siencyn of Cwm-Du, exists from 1790. Her husband, David Griffiths, died in 1791. They left a son and heir – Thomas Griffiths, M. A., and three other children – David, William and Nell Griffiths. In 1805 David Griffiths and Margaret Griffiths, his wife, lived here. 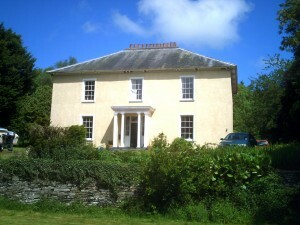 Pantgwyn was referred to in 1814 as a substantial and commodious stone house. In May 1815 Mary Griffiths of Pantgwyn died aged 19. The house is said to have been rebuilt for George Woolgar Griffiths in the 1830’s. In 1830-50 George Woolgar Griffiths lived here and owned the property. He married Henrietta Justina Millingchamp of Plas Llangoedmor. In 1837-76 Henrietta Justina Griffiths lived here. On 24th October 1837 Robert Manners Griffiths (born 8th October 1837), son of George W. Griffiths and Henrietta J. Griffiths, was baptised at St. Mary’s Church, Cardigan. On 12th December 1839 Mehetabel Louisa Griffiths, daughter of George W. and Henrietta J. Griffiths, was baptised at Cardigan. In 1841 the following persons lived here: George Woolgar Griffiths, 40, surgeon; Henrietta Justina Griffiths, 30, his wife; Henrietta Griffiths, 10, their daughter; Elizabeth Griffiths, 5, daughter; Mehetabel Louisa Griffiths, 1, daughter; and servants – Elizabeth Edgar, 25; Owen Davies, 40; William Rees, 20; Mary Hien, 30; Rebecca Rees, 20; Elizabeth Owen, 20; Hannah Williams, 20; Rachel Owens, 35; Elinor Edwards, 35; and Sarah Griffiths, 20. On 1st November 1847 Henry Woolgar Griffiths, son of George W. Griffiths and Henrietta J. Griffiths, was baptised at Cardigan Church. George Woolgar Griffiths died in April 1850, aged 57. Llangoedmor Church has a window dedicated to his memory. In 1851 the following persons lived here: Henrietta Justina Griffiths, 45, widow; George Griffiths, 19, her son; Elizabeth Griffiths, 15, daughter; Mehetabel Louise Griffiths, 11, daughter; Henry Woolgar Griffiths, 3, son; Anne Evans, 29, cook; Martha Thomas, 19, house-maid; Margaret Davies, 23, kitchen maid; Jane Jones, 24, dairy maid; Sarah Jones, 19, barn girl; George Wagner, 26, butler; Thomas James, 32, farm bailiff; Evan Jenkin, 34, gardener; and William Griffiths, 14, errand boy. T. W. and G. S. Griffiths lived here in 1854. In 1861 the occupants were: Henrietta Justina Griffiths, 52; Mehetabel Louise Griffiths, 21, her daughter; Henrietta L. Reynolds, 76, gentlewoman, visitor; and seven servants – Owen Davies, 55, farm bailiff; Joshua Thomas, 31, coachman; Sarah Davies, 30, dairymaid; Mary Evans, 20, under dairymaid; Sarah James, 19, cook; Mary Jones, 17, housemaid; and Hannah Griffiths, 16, kitchen maid. In 1866 reference was made to Thomas Reynolds Griffiths, formerly of Pantgwyn. Captain Thomas Reynolds Griffiths of Pantgwyn died in 1870. In 1871 the following persons lived here: Henrietta Justina Griffiths, 61; Mehetabel Louise Griffiths, 31, her daughter; Sarah Evans, 22, cook; Sarah Lewis, 24, housemaid; Jane davies, 26, dairy maid; Anne Elias, 22, under dairy maid; Daniel Evans, 22, farm bailiff; and David Davies, 42, coachman. On 4th March 1873 a timber sale was held here. Mrs. Henrietta Justina Griffiths – widow of George Woolgar Griffiths, died in March 1876 aged 69. On 26th January 1880 the gardener, Griffith Jenkins, died aged 29. In 1881 the following persons lived here: Aprillo M. Griffiths, 16, daughter; Emma L. Mandrow, 24, governess; Frances M. Phillips, 19, visitor; Elizabeth Nicholas, 31, parlour maid; Margaret A. James, 20, housemaid; Ann Phillips, 18, cook; Rachel Roberts, 36, laundry maid; and Lewis Thomas, 30, coachman. On 8th October 1881 John Lewis died here aged 85. In 1885 Frances Elizabeth Griffiths, eldest daughter of Captain Thomas Reynolds Griffiths of Pantgwyn, married Edwin John Moore Lascelles, eldest son of Rowly Lascelles of Pencraig, Llechryd. A son, Edwin Charles Griffith Lascellese, was born to Frances Elizabeth Lascelles, in 1890. Lieutenant-Colonel John Richard Howell lived here in January 1890-1912. In 1891 the following persons lived here: John Richard Howell, 55; W. Susannah Howell, 51, his wife; Marianna Simmons, 44, sister-in-law; Louise Maria Simmons, 19, niece-in-law; S. N. B. Simmons, 15, nephew-in-law; Marian Williams, 38, cook; E. G. Lloyd, 22, ladies’ maid; Eleanor Herring, 39, housemaid; Anna Goring, 24, kitchen maid; Elizabeth Evans, 39, dairy maid; George Morgan, 52, butler; John Griffiths, 22, footman; David Davies, 21, groom and coachman; David Williams, 22, groom; and Thomas Young, 40, butler. In 1896 J. R. Howell became the first president of the new Cardigan Golf Club. In January 1899 Mary Anna Smith Wilson died here aged 32. In 1899-1900 Col. J. R. Howell and his staff, including Mr. Lewis, J. Evans and Miss Vaughan, lived here. In 1901 the following persons lived here: John Richard Howell, 65 (b. Cilrhedyn, bilingual); Wilhemina Susannah Howell, 61, his wife (b. Newcastle Emlyn, English-speaking); Mary J. Lewes, 41, visitor (b. Llanfihangel Ystrad, English-speaking); John Griffith, 32, butler (b. Nevern, bilingual); Herbert G. Bancroft, 19, footman (b. Bradford-on-Avon, English-speaking); Edith Reynolds, 26, cook (b. Pembroke Dock, English-speaking); B. Maud Coates, 27, lady’s maid (b. Weston, English-speaking); Ellen Morris, 18, kitchen maid (b. Llandygwydd, bilingual); Thomas Korris, 20, coachman (b. Llandygwydd, bilingual); Benjamin Evans, 30, stable man (b. Llandygwydd, bilingual); Margaret Phillips, 24, house-maid (b. Pembrokeshire, bilingual); and Mary James, 21, house-maid (b. Llandygwydd, bilingual). In 1901 Col. J. R. Howell was President of the Cardigan Agricultural Show. Col. J. R. Howell still lived here in 1902 as did John Lewis and Stephen Lewis. In 1903 Julia, widow of Captain Thomas Reynolds Griffiths of Pantgwyn, died. In August 1905 Pantgwyn estate was offered for sale. Col. John Richard Howell died aged 77 on 19th February 1912. His first wife was Sarah, granddaughter of Admiral Lord Collingwood, but she had died before he came to live at Pantgwyn. His widow, Williama “Missie” Susannah Howell, nee’ Lewis of Llysnewydd, died on 10th November 1921. There was a clear-out sale here on 13th-15th December 1921. In 1925-26 William Phillips Jones, surgeon, lived here. William Phillips Jones died in 1931. The property was advertised for sale in October 1938-39, following the death of owner J. A. Jemkins. In 1940 Pantgwyn was a guest house. On 18th December 1948 David Charles William Thomas of Pantgwyn died. In 1950-55 D. C. Thomas lived here. In 1953 Peter Thomas lived here. On 13th September 1957 Pantgwyn, which belonged to Mrs. E. Thomas, was advertised for sale. About the year 1960 it was a guest house. In 1964 the house was listed. In 1994 it became a Grade II* Listed Building. “…EXTERIOR – Earlier C19 mildly classical country house (restored c1990) in colourwashed roughcast with hipped slate roof and long low roughcast centre stack with 13 chimney pots. Two-storey three-window front with rubble stone plinth, paired brackets to eaves and 12-pane hornless sashes in raised plain surrounds. Centre 6-panel door with sidelights and overlight with radiating bar fanlight. Projecting flat-roofed classical porch with two timber Roman Doric columns paired with corner square piers, cornice with paired brackets. Two slate steps up. Windowless E end, two-window W end, and rear NE 12-pane sash each floor to left and centre long 21-pane stair-light. Long rubble stone NW service range with stone ridge stack and brick end stack. Three-window W front with 16-pane sashes above and to ground floor right, and two French windows, all with cut stone voussoirs. E front has two-window range of 12-pane sashes to left, two windows above, one window and door to ground floor, then 15-pane stair-light at mid level, then ground floor 12-pane and further two-window range to right, both 12-pane above, door and 16-pane below. Cut sandstone voussoirs. Across N end gable is lean-to single storey, projecting to E and hipped at NE angle, the S facing wall of the projection has blocked window above, door and window below. INTERIOR – Fine complete earlier C19 interior with panelled shutters, 6-pane doors, reeded ceiling borders with square corner rosettes. Entrance hall giving on to axial stair hall with broad L-plan stairs, stick balusters, ramped rail and scrolled tread-ends. SW room has later C19 arched marble fireplace with Japanese style grate by T Jeckyll (design registered 1873), SE room has coloured marble C19 fireplace with corner roundels and W end arched recess. Small NE study. Two stone vaulted cellars. Kitchen has fine built-in dresser. One rear room in service range has heavy timber lintel to fireplace. I lived in pantgwyn mansion flat in 1971/72 born in Cardigan hospital. I have a picture of myself in front of it. If I send the picture would you be able to confirm the building? At the time it belonged to Mr Bedall-Smith and or lucas-Lessner. I still have a birthday card from them!